« Clear your calendar, Bike Week LA 2015 is here! Network connectivity is one of the primary themes we talk about in bicycle planning that is often associated with the mass adoption of the bicycle mode-share (recent discussion on this). 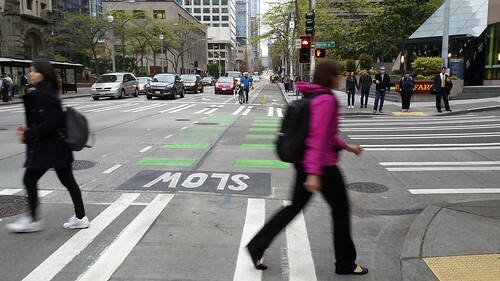 Writing streetscape and connectivity provisions into the zoning code was suggested in a session on zoning for bikeability, where the desired proposed end would be core transit corridors that serve as great places to live, work, and play. Supporting local business was also an important aspect of building these corridors, because business, transportation, and land use planning all intersect in the nexus necessary to foster the culture and identity of great streets. How do our roads serve place? 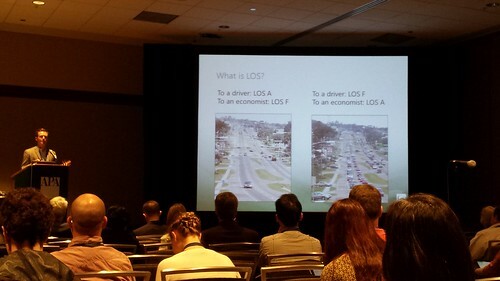 The best reminder from these transportation-meets-land-use sessions was that people come to places for the land use – the market, the gallery, the movie theater, or the hair salon, rather than for the particular mode of transportation or parking facility we tend to plan and build for. Interestingly, the retail experts that presented on what makes retail work illustrated a picture of demographic research, criteria, and capture area very similar to that which we have observed for trips by bicycle. Considering that 47% of trips in LA county are under 3 miles, the connection between bicycle access and retail locales is an important urban planning consideration, one that we work on in Los Angeles by planning for first/last mile connections – our upcoming bike share system, Bicycle Friendly Business District, and the Bicycle Friendly Business Program. Studies reported at the conference observed trending behavior in millennials and boomers alike: they’re moving places where they can live and work (and shop!). 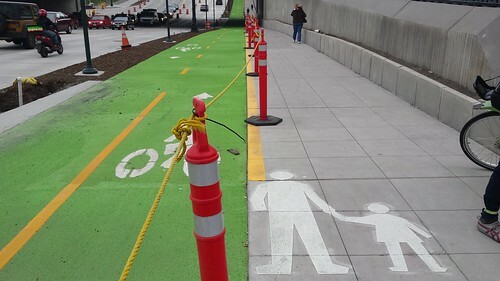 Amazon-funded cycletrack and adjacent sidewalk, for the whole family! 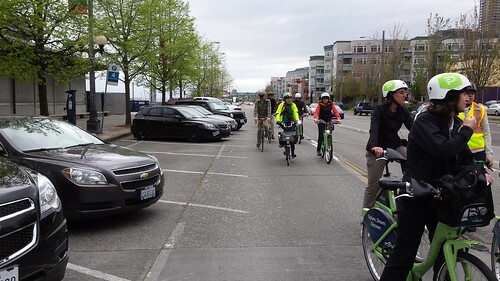 Outside the conference rooms, we checked out Seattle’s bicycle infrastructure. 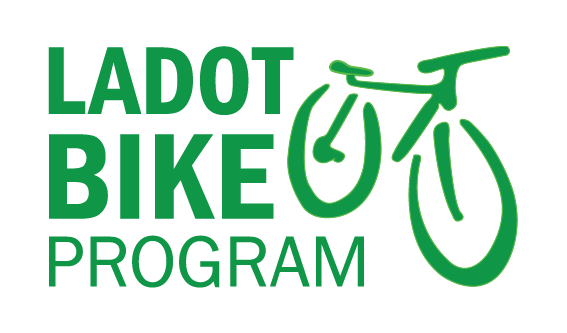 Much of it has been installed in the last two years, along with their bike share system, Pronto, launched in 2014! Though we did experience some tourist-style hijinks resulting from finding ourselves in a city rich with hilly topography, we got to experience a wide variety of bike facilities. 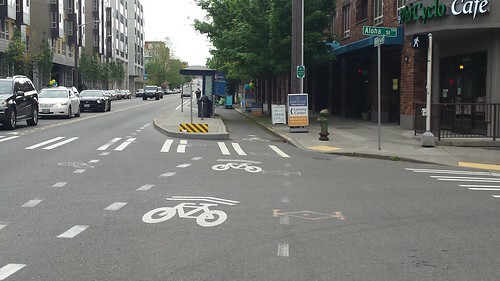 Seattle now features raised cycletracks, two-way signalized protected bike lanes, sharrows up hills, and waterfront bike paths. The most impressive part of being a tourist in Seattle was observing the driving culture and the respect paid to pedestrians. Cars are legally required to yield to pedestrians, and they do, giving people walking the right of way. The civility between people driving and walking seems to be a cultural value in this town, where we observed a significant amount of social shaming for drivers who do not yield. 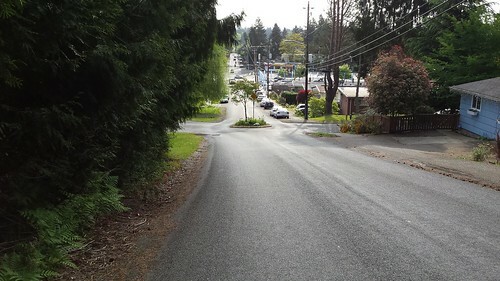 Seattle has also built its neighborhood streets for slow and safe speeds, placing mini roundabouts at nearly every intersection within some residential neighborhoods. All in all, it was a great experience to see a city that was truly engaged in and experimenting with sustainable practices, in the street, at the neighborhood level, and beyond. 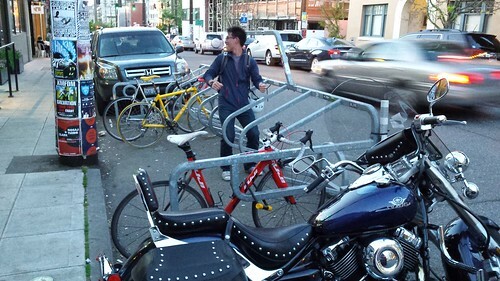 Andrew Kao from Metro’s Bicycle Program makes sure everyone’s all aboard as he drives this bicycle corral to a sustainable future!